This birth assistant training aid appears to be a great training tool for birthing, and a great teaching tool. But dear god some of these images are terrifying, especially when it starts spewing out simulated blood and plastic babies. 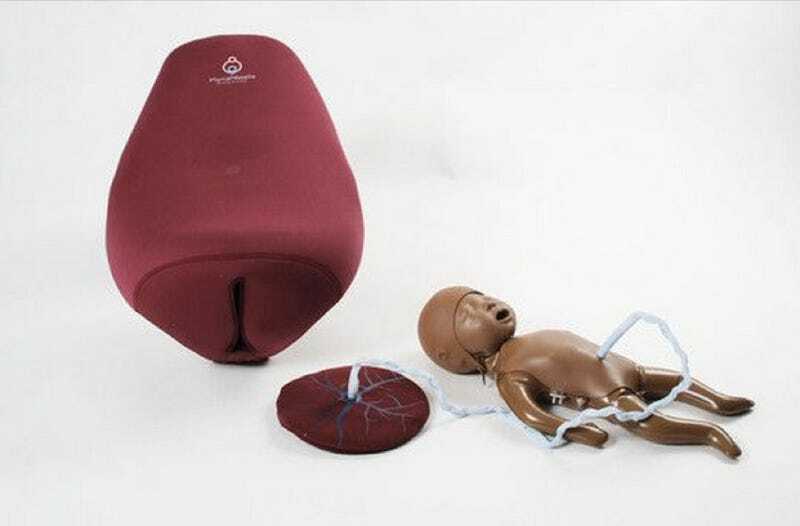 Created by Laerdal, the folks who also sell CPR dummies and a lot more, MamaNatalie is a birthing simulator that has it all. IT ALL. Not only is there blood concentrate in the kit, but there's also a fake baby, a fake placenta with umbilical cord, fetal stethoscope, more fluids, fluid collection, a simulated fetal heart beat and just about everything you could need to experience a fake birth. EVERYTHING. Honestly, this is probably the most elaborate birth training tool we've ever seen. And even though watching a sack give birth to a fake baby covered in fake blood is odd, it's also pretty great. While we're sure nothing compares to the real deal, it's nice to see tools being created that educate folks on the reality of the delivery day. So more power to this fake baby birthing contraption if it gets the word out. Let me know if the fake bump also craps on the table as well. And it all fits into one convenient backpack. The future is now!